Accessibility measures the ease of reaching destinations. The higher the travel cost the lower the accessibility. It also measures the value of destinations, the more activities at the destination, the more valuable it is. Accessibility does two things, first it increases total wealth. Agglomeration economies caused by new infrastructure make aggregate output larger. But second, it redistributes wealth, as the locations where the accessibility gains are larger gain more of that aggregate wealth. Places which do not increase accessibility at least as much as average may find themselves losing economic opportunities which will relocate to take advantage of the accessibility benefits. The reason for describing the hub networks in the previous section in a paper on economic development is that the hubs, because of their respective positions, will capture accessibility benefits disproportionate to their already relatively large share of the population. First order beneficiaries are New York, Chicago, Los Angeles, Seattle, and Orlando, as they will be hubs of the new HSR networks. Places where the network branches will also see some benefits, but not as great. Second order beneficiaries are Atlanta and Dallas, which are hubs of the next generation networks. Third order beneficiaries are cities like New Orleans, Kansas City, Louisville and Raleigh which tie together multiple hub networks. Other cities on the networks will also see absolute accessibility gains, people in those cities will be able to reach more people in less time (or with higher quality, or at less out-of-pocket cost). 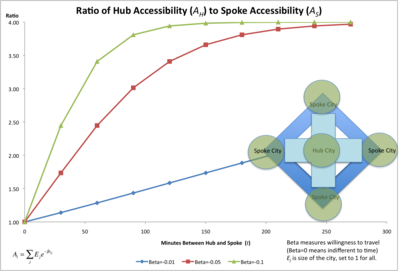 However, while they may achieve absolute gains in accessibility, they may lose in relative position, as a greater share of the now larger total accessibility is accumulated by the hub cities. 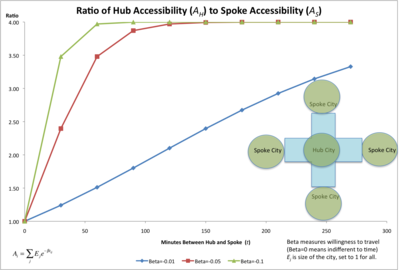 A simple accessibility model is constructed between five cities, a hub and four spokes. In the first case, it is a strict hub and spoke network, so that to go between any two spokes, one must travel through the hub. It is assumed that otherwise all cities are of equal size (and thus value), and the four spokes are symmetrically placed. In the second case, direct routes between the spokes are constructed, so to go from, e.g., the east spoke to the south spoke there is a direct route (at a distance of ÷2 times the distance between the spoke and the hub), but to go from the east to west spoke cities still requires passage through the hub. Schedules are assumed indifferent. The accessibility model follows the classic Hansen model  in which impedance is a negative exponential function of time. The results are shown in . As can be seen, as willingness to travel decreases, and as time increases, the advantage over the hub and spoke increases from 1 (no difference) to 4 (the hub has four times the accessibility as a spoke). This is because if the time is great enough (or willingness to travel low enough), people can travel from a spoke to the hub, but the cost of reaching a second spoke through the hub is too great to be valued, while the hub, due to it centrality, can reach all four spokes. In the second case, with direct routes, the same pattern emerges, but the spokes are relatively stronger (though still not as strong as the hub).